← Media Release: Santa celebrates environmentalist’s second Christmas in the tree tops. As I looked out across the rain obscuring my view of the valley I felt overwhelmed with relief. There is only one thing on my mind – I am so happy to be alive and be here right now. Tasmania has been on fire. 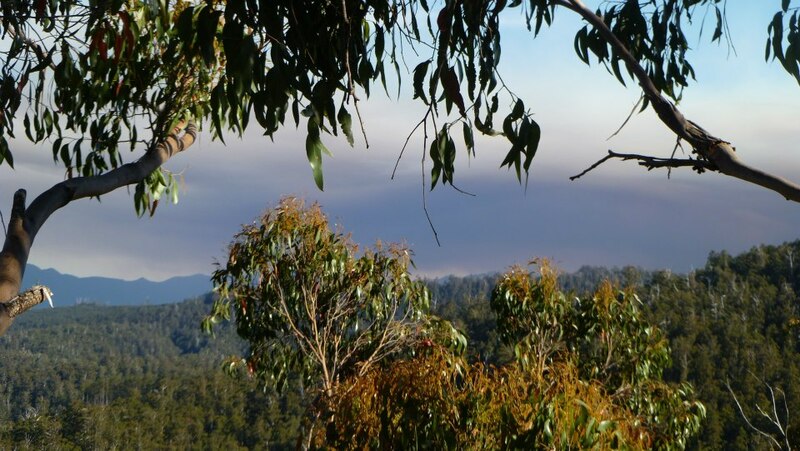 The bushfires kept a good distance from me, and I was always safe. But it is still one of those times that remind us of what is important, one of those moments of appreciating the very fact of being alive and safe. Tasmania takes a moment to sigh with relief. A moment to appreciate that friends and family have survived. And then the loss that surrounds the bushfire affected communities begins to sink in. Communities have been torn apart by the raging fires. People have lost their homes and everything they own. Children have lost their school. I can barely begin to imagine what it must be like for those communities who must now try to rebuild their lives from the ashes. Yet it is moments like these when the human spirit shines through and you can’t help feeling a sense of hope. 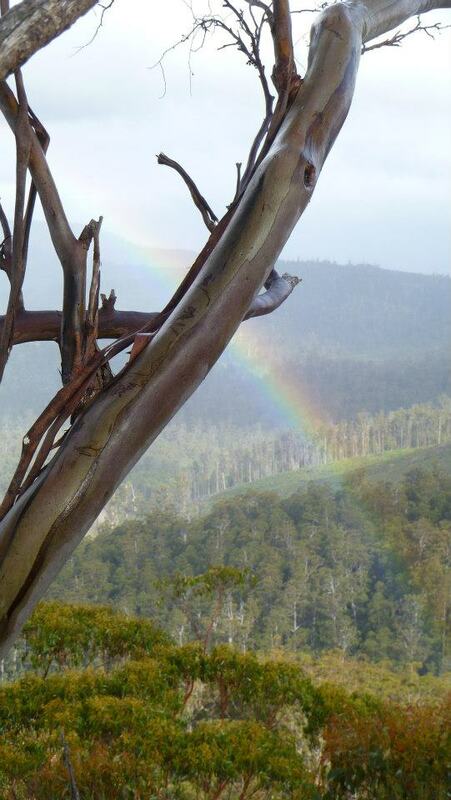 I have been closely following an incredible facebook page Tassie Fires – We Can Help. Please, I encourage everyone to check it out and see if there are ways that you can help. I want to say a huge thank you to the inspiring Mel who has been running this site tirelessly since the bushfires broke out. The site is a chance for the community to connect, for people to reach out to offer assistance or ask for a hand. People have jumped up to help in all manner of ways – from providing fun activities for children, to transporting animals to safety, cooking bbq’s. Boats have beeen found to help people escape the Tasman Pennisula when the fires blocked the only exit. Donations have been collected far and wide. Children have been making gifts for other children, and books for the new school are already gathering. It is so heartwarming. And in a state that is so often defined as “divided” the community has stood togther. People who would never have set foot in the Huon Valley Environment Centre have crossed the threshold as soon as Jenny Weber opened the doors of the centre as a donation collection point. Greenies and non-greenies have stood side-by-side : in the fire service and SES. In the BBQs and the donation runs. And it’s not just people from Tasmania that can help – from anywhere across Australia and the world there are things you can do. So check out the facebook site by clicking HERE. When I reflect on the past week, it feels overwhelming. But what I have been through, I know, is only a scratch on the surface of what it must have been like for so many people. Thank you so much to everyone who sent me messages of support and concern – checking that I was okay as the news of these fires made it’s way around the world. It was last friday when it began. It was so hot here that day, and the wind was no relief as it hit the tree in hot, dry gusts. It’s the kind of day that I wake up anxious. The kind of day when I know that out there somewhere fires will burn. And they did. Smoke billowed up from behind Mount Field; it looked as though the mountain was a volcano. At night I watched as the clouds of smoke turned orange and pink. The glow of the fire made the world look like it had turned on it’s side… like the sun was setting in the north. The fire glowed all night. And then a bushfire started in the South West Wilderness. Now it began to feel like I was surrounded. I have a really good fire plan in place. Both a quick evacuation plan ready to roll out if the fire begins to head this way, and a worst-case senario plan ready as a back-up. I have a whole area of my tree-sit dedicated to fire gear – with a gas mask and oxygen tank, fire blankets, fire resistant clothing etc. This is just in case. Hopefully I will never have to use it. But getting stuck out here unexpededly in smoke is something that I don’t want to risk not being prepared for. Of course, the best plan is to leave early, and so it was that last friday I packed my bag, and my gas tank and hung them up next to my climb line. I put my decending device on the line, ready to go. Any sign of approaching fire and I would be ready to clip in, grap my bag and make the trip down to the ground after over a year of being up here. A lot of things went through my mind. It was a day of processing my fears not just about the fires, but about getting down. I had to mentally prepare myself for the fact that at any moment I might have to leave the tree and go into that world out there. A world that now seems overwhelming. I began to realise how, in order to stay up here, I have had to employ coping mechansms, and these have given me a stange outlook on going to the ground. The ground is just there, only 60 metres away. But for me it is forever away – it is a place that I cannot go to, a place that I almost pretend does not exist, because it can’t exist in my reality. You know, I used to sometimes climb around on the branches just below my platform, but for a while now I haven’t even been doing that. Going below the platform at all, even if it is just a metre or two, feels daunting. It’s like I have had to pretend that there is nothing outside of this little platform and now I feel like that is really true. So to suddenly be thrown into a day when I knew that at any moment the fires might force me to evacuate – it changed everything. In my mind I had to imagine what it might be like. Imagine the trip in the car (something I haven’t even seen in over a year – though I hear them on the odd occasion). I imagined the possibilty of being evacuated to a community fire refuge – with all the local residents. Seeing more than two people at any one time – also something that now feels completely unfamiliar. Houses, roads, cars, buildings…. what will that all be like? And most of all, what will it be like not to be here? Not to be beside this tree? I know of course that it is coming one day, and I want that day to come – I want to see these forests protected and get down. But I hoped it would not have to be so sudden and for such a stressful reason. As the winds kept blowing and the fires kept burning, I watched carefully. trying to make a calculated assessment. I constantly checked the Tasmanian Fire Department website; the Bureau of Meteorology, to see where the wind was heading; the Tasmania Police website for any road closures. I watch the horizon for smoke. And I can not thank enough more amazing support crew. On high alert, ready to implement evacuation plans at any moment. The amazing people who stayed up throughout the night to keep checking the fire website so I could get some sleep without having to worry about suddenly waking up to a fire coming over the ridge! When the rain came… well, I have never been so happy to see rain in all my life! It didn’t mean it was over yet, but it was definetely going to help. The first rain that I saw was like a small miracle. 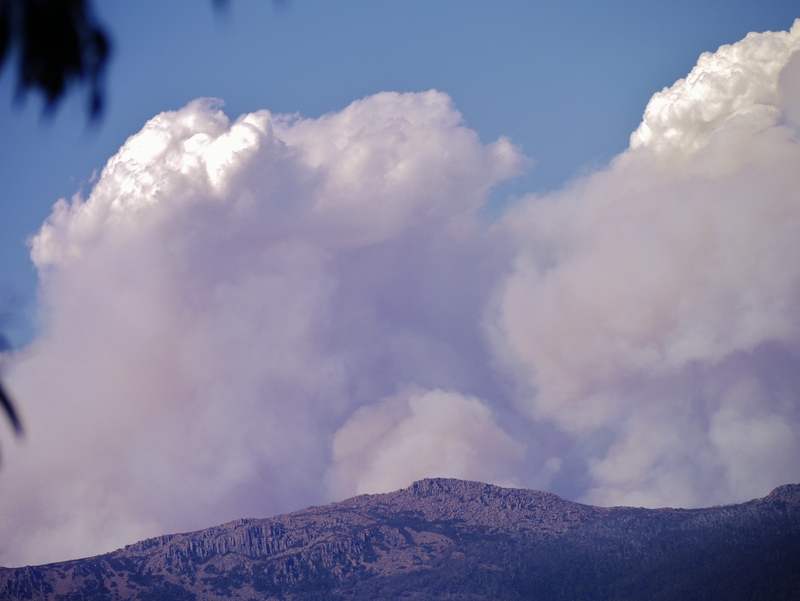 I saw a dark cloud gathering over behind Mount Field, and at first I wondered if it was smoke from the fire, as it was directly above the blaze. But then that familiar streak – a patch of rain falling direcly over the fire – well, at least that is what it looked like from here. It was amazing. Then slowly the rain began to close in across the whole valley, as far as I could see into the distance. It rained and rained for two days. Only in a place like Tasmania could you have such an outrageous contrast. 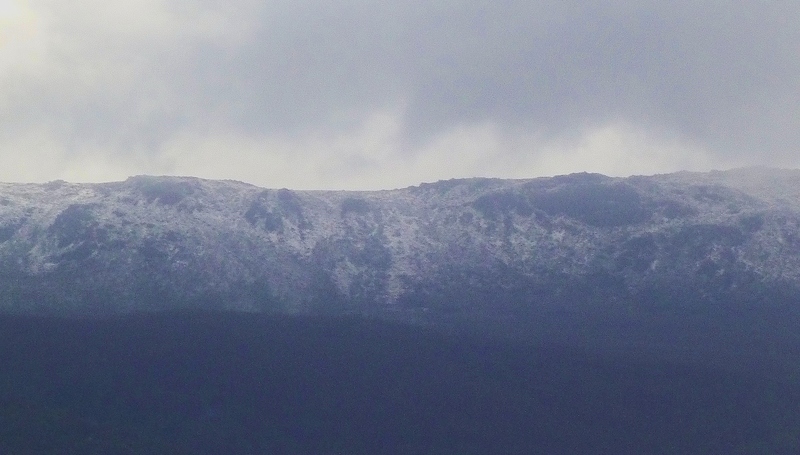 Within days of our hottest day on record, I sat wrapped in a blanket, looking out at a snow-covered Mount Field, and even had some slushy drops of snow on the tarp above me. I hoped that the rain and snow would slow down the fires, but I still remained on high alert. It’s been over a week since the bushfires started, and they still burn. The South West Wilderness fire that is still not under control. But I remain vigilant, keeping watch and keeping ready. I am so thankful that the fire did not spread to here. I would have gotten down at first sign of risk of course. Staying in the tree is important to me for this campagin, but staying safe is of course more important! I am just so relieved that it didn’t come to the point where I would have to make that choice. I am so glad that I am still up here in this tree. But even as I write that I feel sad – knowing that so many people had to make that choice, had to leave thier homes. Many have not been able to return yet, or have lost their homes. So while I am incredibly grateful for what I have, my heart goes out to all of those affected by the fire. That is why I encourage all of you reading this to support the appeal to help those communities rebuild their lives. Posted on January 17, 2013, in Daily Blog. Bookmark the permalink. 16 Comments. Thank you Miranda for such a lovely story of what it was like for you. The Tassie Fires We Can Help Fb page has been such an amazing coming together of the Tassie community. I was able to meet a crayfish boat out of Margate and saw heaps of donations late on that Saturday night sending food and water to people stranded. Since then I have seen boats go out from Margate loaded with stuff, People connect through TFWCH FB page and many other amazing things are happening to support the Tasman and Forestier Peninsula communities now that fences can be rebuilt and people can get back by road.. TFWCH will be needed for a long time to come – people have so many ideas about how to renew their community. .
how incredibly brave you are Miranda, I am so glad that you have such a good evacution plan in place and your support team is there for you. Your beatiful nature is evident with your concerns for the people of Tasmania, you have expressed it so well and I know that poeple will give thier support. I’m glad you’re OK. Still watching your blogs. Wonderful writing by a truly awesome girl! Looking at that photo of the smoke rising, I marvel at your courage in staying put. But I am also glad you have plans to evacuate if necessary. I pray that the fires will soon die down. Miranda, So glad to hear you have a good safety plan in place. I have been thinking of you every day here from the mainland, where we are also experiencing terrible fires. If you have to leave the tree, you know you have made a huge and selfless effort. and all your supporters know this as well. There will be close and understanding friends and family to help you reconnect with this world on the ground when the time comes, and it will take time. Your concern for all the people affected by the fires, shows what a good and caring person you are. Also thanks to your supporters at the base of the tree, making your life more comfortable, with food and maintenance, they are also good, caring people. What Cass Rea writes about is correct. Because of your dedication to the forests, you will be privileged — as few other people are — to know who Tree is and how Tree thinks and feels. Being on the ground again will allow you to visit other members of your family of trees. I’m happy you’re safe and enjoying the rain. I just found out about you and your courageous actions today. From here in Georgia, USA, you are very far away indeed; but, your cause is one with us here that fight to protect the mountain wilderness areas of the Southern Appalachians. I applaud your courage and fortitude! I could never do what you are doing, but I am always aware that, without people like you, people who are willing to make a truly full commitment to environmental protection, we would be in a terrible situation. Thank you very much and keep up the fight! Your courage and determination are inspiring. Please keep safe and look after yourself. Thank you Miranda. You are a true Hero.